According to data recently released by the government, Spain’s economy has returned to its pre-crisis size. Naturally, this has had a positive impact on numerous industries in the country, not least of all its burgeoning property market. Indeed, property sales recorded in Spain’s land registry soared in October 2017, up 28 percent from the previous year – the biggest increase since the housing market recovery began. 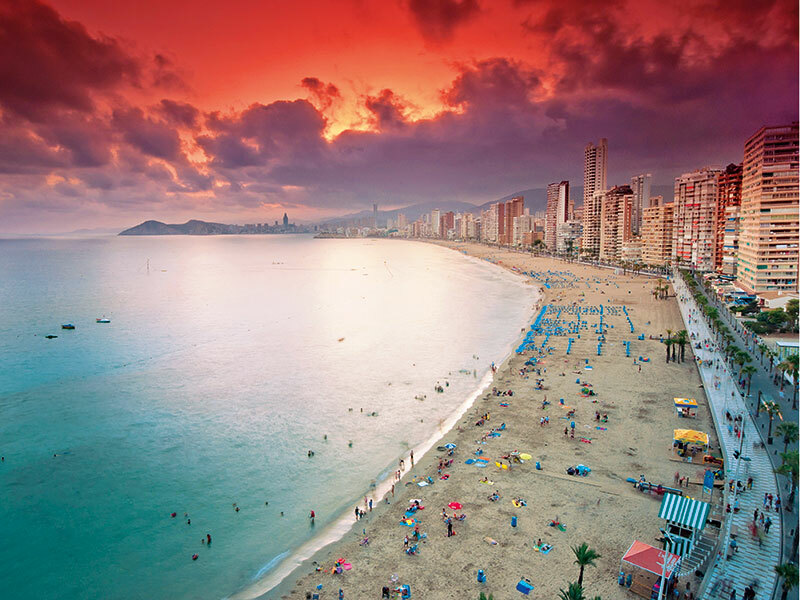 Benidorm, a seaside municipality in the province of Alicante in eastern Spain, is a key driver of this trend. In fact, it may surprise many to learn that Benidorm is the fifth most searched-for location in the world for property investment. With brilliant weather and blue skies all year round, many have come to compare Benidorm to Las Vegas. Like Nevada’s desert sanctuary, tourists from around the globe love to stroll down Benidorm’s palm-lined promenades, relish in its abundant choice of bars and restaurants, and soak up a skyline that features skyscrapers as far as the eye can see. Another similarity between the two holiday destinations is the fact around 85 percent of rental properties are occupied all year round. This is a huge difference in comparison to other popular locations around the world – and especially those in Europe – which can only offer rental income during high season. 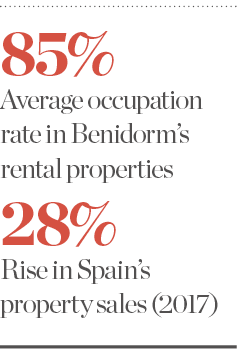 What’s more, Benidorm’s rentals predominantly comprise short-term visitors, who bring the highest return on investment (ROI) to any property owner. In order to take advantage of Benidorm’s increasingly popular investment market, most of our clients seek to acquire corporate bonds. This is simply because of the numerous benefits corporate bonds offer. More specifically, there is no mortgage involved, no maintenance fee and no great effort in finding tenants – all elements that usually cause investors a lot of hassle. Corporate bonds, therefore, present a simple, easy and secure investment that generates a fixed return straight into your bank account. They are safe and consistent for investors of all levels, with investments starting from as low as €5,000. Further, with corporate bonds there is no need to travel to a property yourself; investors from around the world can benefit from Benidorm’s booming short-term rental market by purchasing corporate bonds via our website. You can even order the bonds online. We offer investors two ways of entering Benidorm’s short-term rental market. The first option involves us identifying a property within a specified budget – with or without a mortgage, depending on your preference. Our second offering, which 95 percent of our clients opt for, involves buying properties in the best rental areas of Benidorm as one of a group of investors. As part of this package, we continue to manage the properties and find short-term tenants, generating a ROI of approximately eight to 11 percent every year. We are the first and only company in Benidorm to offer this option. Most clients who decide to go it alone simply do not make the same returns as those who take advantage of our group offering. The main reason for this stems from the fact that they are not from Benidorm and, most importantly, they are not available all year round to manage the property effectively. Further, it’s more difficult – and certainly more costly – to manage one property than it is to manage and promote 50, 100 or even more properties. It’s also worth noting that we have close working relationships with all of the major banks operating in the Costa Blanca, such as BBVA, Sabadell Sol and Santander, to name but a few. As a result, we can offer our clients the pick of the market’s repossessed properties. When combined, these factors make a drastic difference in terms of ROI for foreign investors. In our experience, we have found that real estate investors tend to opt for corporate bonds or real estate funding structures, rather than choosing to finance the investment themselves. This works out well for BND Levante Group, as the more bondholders we obtain, the more properties we can buy, which in turn benefits our bondholders further. Despite the obvious advantages offered by corporate bonds, we understand that not everyone is interested in being part of a collective investment group and will instead choose to fully own and manage a property by themselves. As such, we offer services to help such investors yield the highest ROI. In fact, we’re recognised as the best partner in Benidorm for finding foreign parties an investment property suited to their exact needs – whether it’s a second home or a new property development in the Benidorm area. This reputation stems from the amount of time we’ve spent in the market and the extensive local knowledge we’ve collected as a result. We scan the market every day for new opportunities to ensure our bondholders don’t miss a trick. BND Levante also helps clients to promote large developments. For example, we are currently promoting the most exclusive new beachfront development in Benidorm. This state-of-the-art site uses an advanced energy efficiency system which, combined with its unique double-skin design, will enable it to obtain the LEED Gold sustainable building certification. Buildings that receive this recognition are renowned for being respectful of their environment, using less energy and water, as well as benefitting from reduced operating and maintenance costs. This project, therefore, serves as an excellent example of forward-thinking design and innovation in Benidorm, while its prime location makes it one of the hottest developments around. This year has been a successful one for both Benidorm and BND Levante – and it’s not over yet. We are also planning to introduce an alternative real estate bond at the end of this year, or early next year at the latest. With this bond, we plan to buy a first-line beach plot and develop our own 20-to-30-floor skyscraper, before selling it to the highest bidder. Unlike our current corporate bond, this will not give investors a fixed monthly income until the project is completed. We will, however, offer our bondholders the chance to choose a combination of both bonds, allowing them to benefit from a large return at the end of the bond period, as well as receive a fixed monthly income in the intervening period.